Whether it’s a phone, tablet, or laptop, we always seem to have a device that needs battery life. 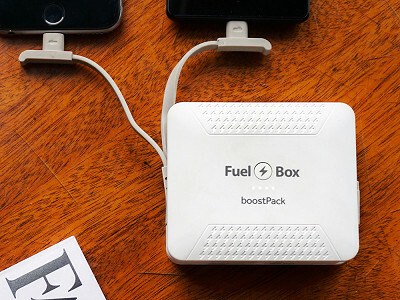 FuelBox keeps you powered up at home as well as out and about. 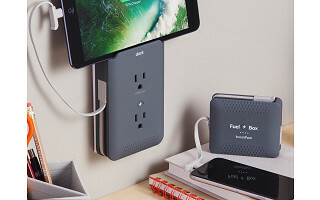 The design goes over a three-prong outlet and blends right in, becoming a low profile charging station for up to five devices. There’s a USB charging dock on top, and neatly folded up inside are micro-USB and lightning cables. Unfold them when you want to charge, then tuck them neatly away when you’re done. Before you hit the road, remove the boostPack to take power with you. It’s ready for easy removal, because it’s held on top of the Charging Station with magnets. With a micro-USB and certified Apple lightning cable of its own, the boostPack powers two devices up to three times faster than a typical charger. And it can fill a device’s battery up to four times. It won’t matter where you are. Next time your device needs fuel, this power station is on it. Hello everyone! 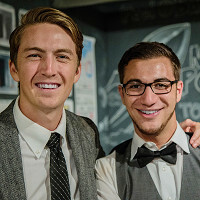 I’m Dan Friedman, Founder & Chief Marketing Officer at FuelBox, a Santa Barbara technology startup that develops, manufactures and distributes consumer electronics. The FuelBox is the first universally compatible charging solution for all mobile devices that provides stationary charging at-home and mobile charging on-the-go all in one elegantly designed device. I'd be happy to answer any questions you have! Hi @JOe, no this product isn't just for Apple, it's for much more than that. Both the Docking station and BoostPack mobile battery come with built-in Apple Lightning & Micro-USB charging cords so you can't lose them and won't have to find yourself buying more! FuelBox is compatible with 99% of the phones & tablets on the market today, and also can charge devices such as cameras, GoPros, golf pin seekers and much more! 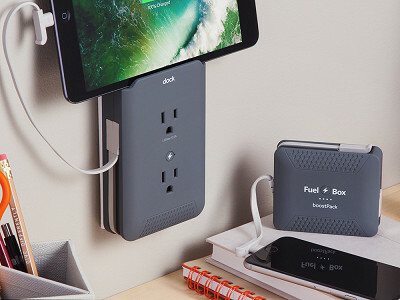 It's the complete charging solution for all your devices. This looks like a great product Dan. I Especially like the removable boost pack. 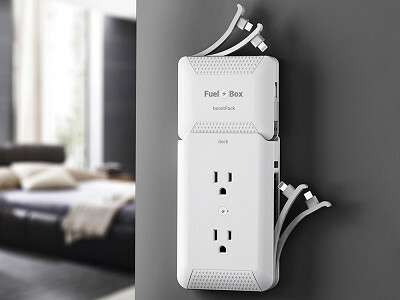 At first I thought it sounded a little expensive, but if you buy the set, the charging station with the boost pack, it's really not a bad deal at all to get the boost for only $40 more. Thinking of buying them for my teenage grandchildren's bedrooms. Thank you very much @Kay! My team and I spent three long years designing and developing it, getting approved as an Apple developer, and receiving all of the necessary safety certifications. It was very challenging, so again thank you for your praise! Hi Dan - can this unit be adapted for use in the UK? Thanks! Hi @Kristin, that's a great question! We currently don't have a converter/adapter for UK outlets, however, we are developing a UK version of the Dock (as we speak) that will charge the boostPack magnetically the same way. We've actually sold the boostPack in 18 different countries already and many people have asked the same question as you, so I assure you we are working as fast as we can to get that developed. In the meantime, the boostPack does make for a great tool to make sure you always have your cords and access to power when you need it most! Is there a version available with just Lightning or just micro-USB? Hi, @Jonathan - that's a great question. We don't currently have one that is only Micro-USB or only Apple Lightning. We developed FuelBox the way it is because we wanted our customers to be able to say "Do you have a FuelBox?" and know that it would work with all of their devices (a one-stop shop, if you will). It's a huge convenience not having to try and find your charging cords in addition to your battery - just keep them together, all in one place! Having said that, we definitely will take your question under consideration for future models of FuelBox, so thank you for that! Anything else I can help you with? Will other boost packs that use microUSB be able to be charged on FuelBox? Hi @james - yes sir! We are developing our future products to charge the same way, magnetically on on FuelBox docking station. 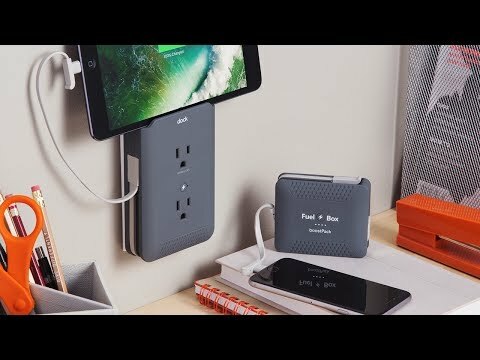 What's great about the FuelBox boostPack (in addition to the rapid charging technology, output charging cords built-in, and ability to charge magnetically on the Dock) is that the boostPack also comes with a built-in USB recharging cable so you can charge it via your computer or USB port. It's perfect for traveling! Anything else I can answer for you right now? Thanks!